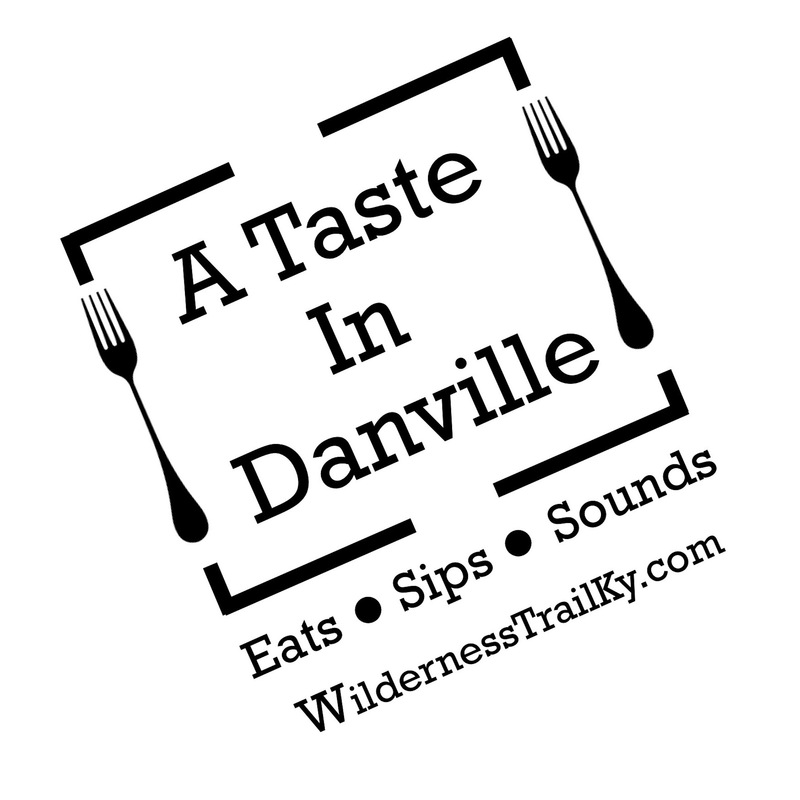 Our third annual A Taste in Danville offers a variety of food and music. It's also our first release of our Small Batch Bourbon with a rye small grain. So of course, we'll have tastes of our Small Batch Bourbon for you to enjoy, but expect a sampler of many types of food. See more on the Small Batch Bourbon below. Come hungry and be prepared to experience a wide array of food options. The 20 food vendors at A Taste in Danville represent cooking from several countries. Danville’s The Still at AMBRAbev offers Brazilian flair and Tut’s features Egyptian dishes. Caribbean Spice is back with Cuban creations while Rico’s Empanadas explores Puerto Rican and Latin American cooking. BBQ fans can veer toward Biscuits BBQ, Triple J&C and Pasture at Marksbury Farm. The Combination prepares TexMex dishes. The Bluebird of Stanford and Danville’s The Caterer and Southern Plate Café guarantee delicious offerings. For a light snack, there is Fox Run Beer Cheese in a variety of flavors or try Sadistic Mistress all natural hot sauces. For the sweet tooth, try buttercream frosted cupcakes by Sweets by Cindy, Bourbon balls by Sandy’s Surprises, 4 Generations Ice Cream or Southern Style Kettlecorn. Elmwood Inn serves up the finest teas, including Bourbon Black Tea. Refreshing lemonade is supplied by Nomelade. If a Bloody Mary or Bloody Susan is your style of waking up, stop by Bloody Kentucky for a bottle of their original or spicy mix. You can't miss their truck. It's an M1079, an American field office truck that was used in Iraq. In addition to tastes, Wilderness Trail offers several cocktails. Country Boy Brewery will be on site with their much-loved brews. Our music will be a feast for your ears. The Brown Family Band of Berea performs first and then Pikeville’s Down To The River band hits the stage. The Brown Family consists of father Yogi, who plays guitar and piano; daughter, Becky, who sings and plays guitar; and son Andy, a bass player and singer who majored in music. Down To the River, which performs songs written by Tony Mullins, combines instrumentals, rock & roll, soul and freeform jams. Down To the River molds blues, country, instrumental jam rock into what they term Appalachian Rock and Roll. We're ready to introduce you to our newest member of the family — Small Batch Bourbon. It's with you in mind that we decided to make this a Small Batch Bottled in Bond. We want you to be able to enjoy a side-by-side comparison with our Wheated, Single Barrel, Bottled in Bond. They share the same percentage of corn (64%) and malted barley (12%) with their mashbills, but we want you to taste the difference when we substitute the 24% wheat with 24% rye. Distillery co-owners Shane Baker and Pat Heist like high-proof whiskey, served neat, so they couldn't resist making the Small Batch a Bottled in Bond so it will be 100 proof. What is a small batch? In this case, it's 10 to 12 barrels. Wilderness Trail proudly uses Kentucky-grown Heritage rye from a local farm, our award-winning sweet mash process, and low barrel proof into a barrel for aging in Kentucky — 110 proof. Then the Rye Bourbon is bottled at maturity with no chill filtration. We're ready to introduce you to our newest member of the family — Small Batch Bourbon with a rye small grain. This happens 11 am to 7 pm April 27 at our annual A Taste in Danville. See A Taste in Danville details. Check out our visit with Haley and Lee from WLEX. It's with you in mind that we decided to make this a Small Batch Bottled in Bond. We want you to be able to enjoy a side-by-side comparison with our Wheated, Single Barrel, Bottled in Bond. Distillery co-owners Shane Baker and Pat Heist like high-proof whiskey, served neat, so they couldn't resist making this Bourbon a Small Batch Bottled in Bond so it will be 100 proof. What is a small batch? In this case, it's 10 to 12 barrels. Wilderness Trail proudly uses Kentucky-grown Heritage rye from a local farm, our award-winning sweet mash process, and low barrel proof into a barrel for aging in Kentucky — 110 proof. Then the Small Batch Bourbon is bottled at maturity with no chill filtration. The cost will be the same as our Kentucky Straight Bourbon Single Barrel Bottled in Bond: $48 ($52.80 with tax). For this special release, we also will offer the Small Batch Bourbon in a mahogany Family Reserve Collector boxes. The cost with a box, including tax, is $86.71. If you are not fortunate enough to acquire a bottle from this limited release, don’t despair. Wilderness Trail also is releasing bottles to Kentucky retailers the following week. Two hundred years of history is quite a milestone and we applaud Centre College for its remarkable journey. 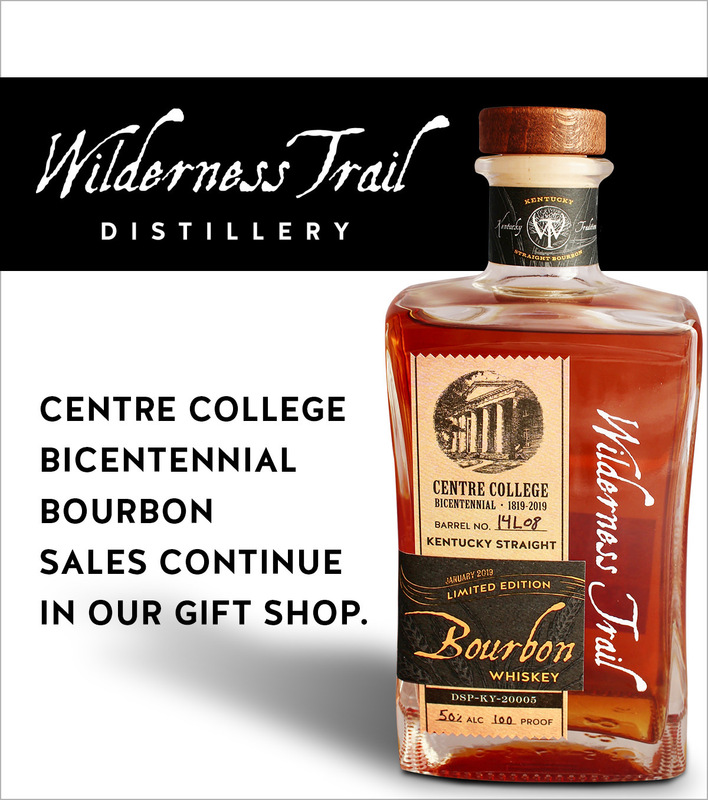 We are celebrating with Centre College with a special bottling of our wheated single barrel Kentucky Straight Bourbon. We were amazed how quickly the first three barrels sold. Our future plans are to release our Centre College Bicentennial Bourbon the second Saturday of every month beginning at 10 a.m. until we close at 5 p.m. Cost is $55 ($60.50 with tax) and it is available in our gift shop. We do offer the Bourbon in a mahogany collector's box that includes two shot glasses. Cost with the box is $94.41 (including tax). We can ship to places in Kentucky where alcohol sales are legal. If you are interested in purchasing, you may download a shipping form. Please include a daytime address where the delivery can be made because someone age 21 or older must sign for it. Cost is $25 to a ship a bottle and the fee increases based on how many bottles will be shipped. Email your form to Macaulay Minton at m.minton@wildernesstrailky.com. Food by Bella Notte food truck. 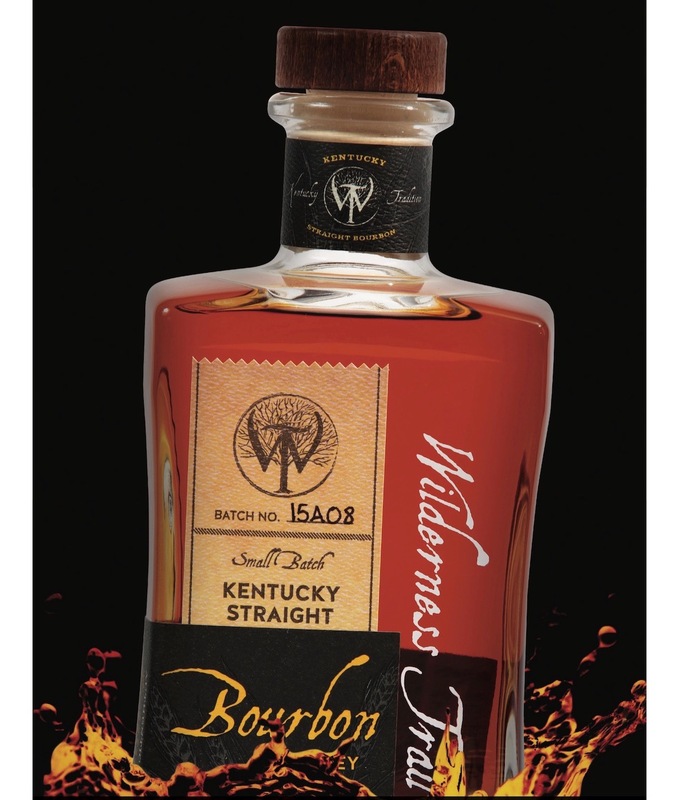 Wilderness Trail's Single Barrel Wheated Bourbon is available to Michigan's Bourbon lovers. We are supplying a list for you to discover where to purchase. Wilderness Trail invites you to show off your cool rides at our third annual cruise-in. 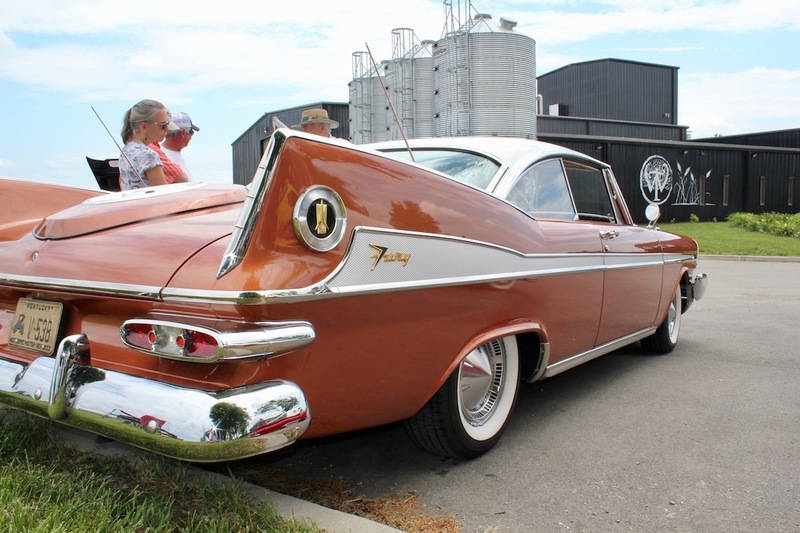 We're expecting a group of 70 cars from the Chicago area who are heading this way as part of their seventh annual Bourbon Blitzkrieg, so this year's cruise-in will be bigger than ever. Hours: 11 a.m. to 4 p.m. All makes and models are invited for this cruise-in that features door prizes and dash plaques. Food by Hill Of Beans BBQ. Thanks to the many people who purchased a white oak seedling in hopes that their trees one day will be used for Wilderness Trail Bourbon barrels. We are planting the 2-year-old white oak seedlings at 2 p.m. March 16. We know not everyone who purchased trees can attend, but we'll put your plaque to mark your tree for the next time you visit. Visit your tree as your come see us over the years. Seventy or so years from now, maybe your grandchildren will enjoy a barrel of Bourbon aged in the tree planted for you. This winter is doling out some bitter cold, but thanks to everyone's generous support of the Charity Chili Cook-Off a lot of Boyle County children are staying warm. The Danville Kiwanis bought coats and clothing for children whose names they received from Salvation Army, Big Brothers Big Sisters, Wilderness Trace Child Development Center and Sunrise Children's Home. No other agency is helping these children in this capacity. The winter warmth supplied from your generosity is a program that began more than 90 years ago. Twenty years ago, the Boyle County Senior Citizens Center became recipients of the the project. 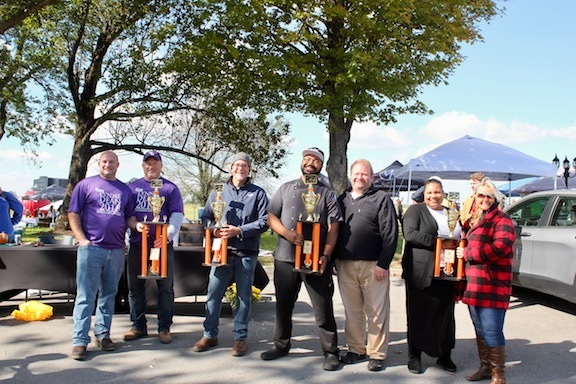 The 2018 Chili Cook-Off raised more than $6,700 to purchase coats, clothing and a small toy for the children. The 40 members of the Kiwanis Club appreciate the support of their mission and know that everyone had a lot of fun in the process. Sure, someone had to win and some ground beef, smoked sausage, regular sausage, spices and a lot of love led Team Dean to the winners circle. Randy Dean, a native of Louisiana, enlisted his son, Philip, to represent the team of Boyle County Attorney Lynne Dean. Close on their heels were second place winners Harvey's, a Danville restaurant, represented by owner Alex McCrosky and Arthur Denmon. Coming in third were Cash Express' team of Ella Mattingly and Shatarra Taylor. Taking the People's Choice honor was Blue Bird in Stanford's chef Bill Hawkins. We thank all the great cooks, vendors and sponsors who made this event possible. Please mark, Oct. 19, 2019, for our next opportunity to make a difference. We appreciate all the people who offered free children's activities. Eddie Tamme brought free pumpkins for the children to decorate. The Boyle County Public Library Bookmobile was on hand with free library books. The Boyle County High School Key Club offered free facepainting and balloon animals. Boyle High cheerleaders sold hotdogs. Thanks also to our awesome judges: Larry Vaught, Chuck Smith, Cameron Mills, and Kentucky Taste Buds Leigh Roach and Tamara Schneider. And where would this event be without great sponsorship? Platinum: Kentucky Cooperage of Lebanon; PNC Bank; Sellers Engineering of Danville; and The Advocate-Messenger of Danville. Gold: Boyle County Attorney Lynne Dean, Bruce Devine Roofing of Harrodsburg; and Gibson, for Boyle PVA and Monticello Bank. Silver: Boyle County Clerk Trille L. Bottom, Buzick Construction of Bardstown; Community Trust Bank of Danville; Corning, Inc. of Harrodsburg; Farmers National Bank in Danville; Monticello Bank in Danville; and Stuart Powell Ford Lincoln Mazda of Danville. Bronze: Bob Allen Motor Mall of Danville; Caverndale Farms of Danville; Central Kentucky Federal Savings Bank of Danville; Gary Chidester for Boyle County Judge-Executive; Danville Eye Center; Fort Knox Federal Credit Union in Danville; Hayslett Mechanical of Harrodsburg; InterCounty Energy of Danville; Keystone Industrial of Junction City; Melton's Great American Deli II of Danville; United Structural Systems of Lancaster; Walnut Springs Farm of Danville; and Wilderness Trace Solar of Danville.